NASA’s Upper Atmosphere Research Satellite (UARS) is expected to make a splash landing on late Friday evening/early Saturday morning. Scientists are currently unsure where the satellite will enter the atmosphere but they claim they will have more of an idea in the final 12 hours before the satellite is due to return. Using data from Thursday afternoon, experts believe the satellite could splash down in the Southern Ocean but this is likely to change. However, the satellite will probably land in one of the world’s oceans based on the fact 70 per cent of the planet is covered with water. Dr Stuart Eves, a satellite and space expert, told the BBC that a satellites lifetime can only be predicted with 10 per cent accuracy and there are large uncertainties in tracking the ‘decay’ of satellite orbits. NASA claims the risk to life is 1 in 3,200 but this is three times more than the 1 in 10,000 risk that NASA usually aims for. NASA says the debris could fall across an area 400-500km (250-310m) long but were keen to stress that no one has ever been hurt by objects re-entering from space. The UARS satellite was deployed in 1991 from the space shuttle Discovery on a mission to study the make-up of the Earth’s atmosphere and particularly the ozone layer. 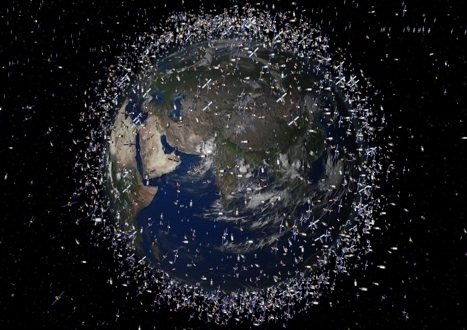 Space scientists estimate there could be as many as 1,000,000 items of manmade debris orbiting the planet. Reducing the amount of debris in orbit around earth is an issue that space engineers have looked into in the past. Lewis added that he is particularly excited about the potential development of a giant passive debris sweeper, a spacecraft with a large surface area that can absorb clouds of smaller debris. Other methods, such as using boosters to push redundant satellites into more distant “graveyard orbits” have also been discussed.